Even The DJ Hero Boxart Rules. Ok, not quite, excuse our blasphemy. Just, look: the game appeals to us on so many levels, and we're sure that we're not the only ones. In the office, we're less likely to have the ol' rock music blasting from our stereo, and more disco, dance, house, r&b, pop and hip-hop. Sure, we're not going to say there's not great rock music out there, but we have no desire to play it over and over again in a video game. Boring. DJ Hero on the other hand, sold us as soon as we heard the actual tracks. A game full of mash-ups and a turntable? Hell yeah. Still, that doesn't appeal on a level field the same way a guitar game does. The DJ scene is pretty niche (although still big in Europe) and people don't get it quite as readily. All that, coupled with a high price, means it's going to take people a while to adopt the game. "We're expecting this to be the type of game that may come out of the gate a little bit slower, but continue to grow over time," Kai Huang, co-creator of the Guitar Hero franchise, explained during a speech at the PLAY Digital Media Conference in Berkeley. We think he's right aswell. We just hope Activision can capture that audience of people like ourselves, that are definitely considered outside of the mainstream of commercial rock group, and want something both a little different, and a little more listenable. 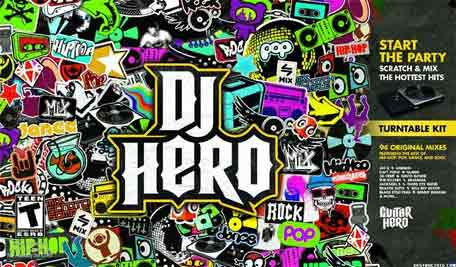 Honestly, DJ Hero could end up being our personal game of the year. It's certainly looking like it's going to be somewhere up there. Here's hoping the sales result in plenty of DLC.